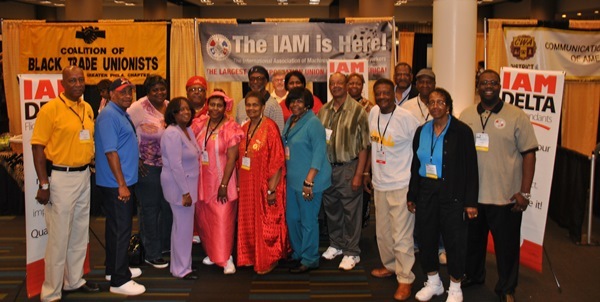 IAM General Vice President Diane Babineaux, fourth from left, is joined by a large contingent of IAM members at the 43rd Coalition of Black Trade Unionists (CBTU) International Annual Convention in Atlanta. More than 500 union members from across the country, including over a dozen IAM members led by IAM General Vice President Diane Babineaux, are in attendance at the 43rd International Annual Convention of the Coalition of Black Trade Unionists (CBTU) in Atlanta. This year’s Convention, themed “Working Together – It Shall Come to Pass,” opened with a call to arms by CBTU International President Rev. Terrence L. Melvin to work closely with new allies and organizations focused on educating, empowering and engaging trade unionists on the pressing issues facing working families and communities. Guest speakers include CBTU President Emeritus Bill Lucy, Georgia AFL-CIO President and IAM Member Charlie Flemming, AFSCME President Lee Saunders, A. Philip Randolph Institute President Clayola Brown and United Mine Workers of America President Cecil Roberts.